Finding your favorite study space can be a challenge, especially during finals season when everyone else is doing the same. Studying at home and inviting friends over may be comfortable and convenient, but the environment can get distracting more often than not. 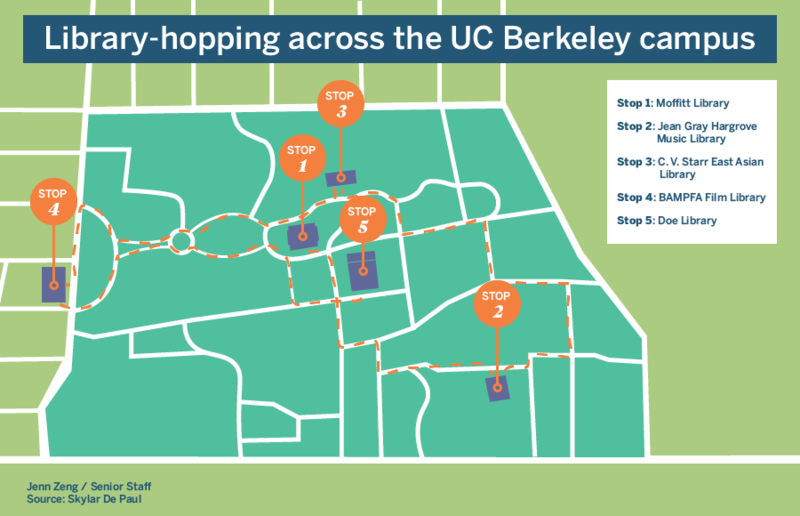 So take a breath, put in your earphones and listen to our “Welcome Freshmen” playlist for background music as you explore Berkeley for the first time. Quiz: Where on campus should you study during dead week? With so many popular libraries and luncheries to choose from, we could all use a magic eight ball to help us choose our study spots. We go to libraries to get work done (well, at least to attempt to get work done). Yet whenever we go to one, there always seems to be at least one person who doesn’t follow the unspoken library code of conduct. These sacred rules should never be broken, and because certain people clearly don’t understand them, we at the Clog would like to put them in writing. Quiz: What pet should you get? Every student is familiar with RRR week and looks forwards to it, for with the onset of RRR week comes the most hyped social event of the semester: library hopping, the nerd’s equivalent to the bar crawl. We at the Clog have compiled a list of alternatives to the basic Berkeley Instagram photos, so that you can have the most unique gallery.